What is the fate of Navy SEAL Team Six? Has the Six TV show been cancelled or renewed for a third season on History? The television vulture is watching all the latest cancellation and renewal news, so this page is the place to track the status of Six, season three. Bookmark it, or subscribe for the latest updates. Remember, the television vulture is watching your shows. Are you? 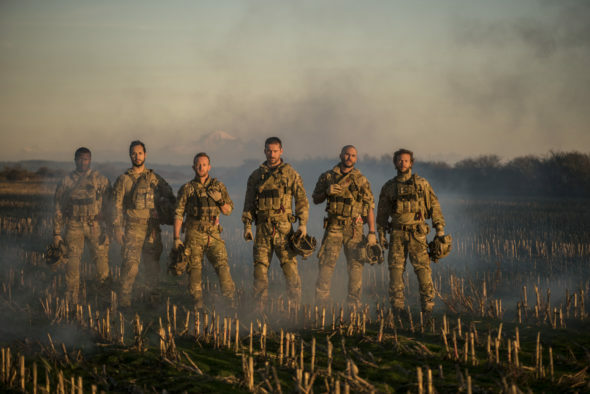 A History military combat drama, Six stars Barry Sloane, Kyle Schmid, Juan Pablo Raba, Edwin Hodge, Brianne Davis, Jessica Garza, Nadine Velasquez, Jaylen Moore, Joshua Gage, Olivia Munn, Eric Ladin, Katherine Evans, and Rus Blackwell. The series centers on the modern American warriors of Navy SEAL Team Six. In season two, Joe ‘Bear’ Graves (Sloane) leads the team to join forces with CIA officer Gina Cline (Munn). Together, they will infiltrate terrorist hotspots in Eastern Europe, on their quest to track the mastermind behind Michael’s (Dominic Adams) jihadist network. The second season of Six averaged a 0.19 rating in the 18-49 demographic and 755,000 viewers. Compared to season one, that’s down by 51% in the demo and down by 52% in viewership. Find out how Six stacks up against other History TV shows. On June 29, 2018, Six was cancelled and the finale aired August 1, 2018. Could it come back for a third season one day? Stay tuned for further updates. Will History cancel or renew Six for season three? The ratings are way down year-to-year so I think Six will be cancelled. If it is renewed, I believe it will be because History wants to keep it around to continue to establish the channel as a home for original scripted dramas. For now, I’ll keep a hungry eye on the Nielsens and update this page with breaking developments. Subscribe for free Six cancellation or renewal alerts. 6/29/2018 Status Update: History has cancelled Six after two seasons. Details here. TV show ratings are still important. Follow Six‘s weekly ups and downs. Check the rankings for History’s scripted TV shows. Find more Six TV series news or other History TV show news. What do you think? Did you hope the Six TV show would be renewed for season three? How would you feel now that History has cancelled this TV series, instead? Loved it – I sure hope they’ll bring it back! Loved the show. Times between seasons was too long. People move on to other shows and then forget about it when it comes back on. Please bring back six. It was a amazing series. Very foolish to cancel a great TV series. Very disappointed..
Just finished the second season on Hulu and so sad to find out it’s cancelled why???? This was a great show that both my husband and I can enjoy. This is so disappointing. The cliff hanger is what we get left with. :/ Why can’t some other Network pick this show up UGH. Please bring it back!!!!! Please bring back to Six season 3 why cancel? I am very disappointed with the cancellation. I have been watching this series for the last 2 yrs and was don’t very happy to find that I could not continue watching. I don’t know if it matters as far as my comment goes but I hope it makes a difference. Please please bring SIX back!! What happens with Micheal? And Bears wife? What ends up happening to Fishbait? Caulder and his concussion, plus his daughter and the disabled vet he met in therapy? Plus the development of “ghetto” and the new medic that saves Fishbait! I mean, come on, REALLY?!!! Truly hope a different network picks it up. I love this show, please don’t cancel it.